Caroline Murat, or Caroline Bonaparte; discover Napoleon's sister through her portrait. I. What do we see in the painting? This portrait of the youngest of Napoleon’s three sisters, Caroline Murat, was painted in 1807. Caroline is wearing sumptuous clothes in typical imperial colours, including a purple velvet cloak and a dress embroidered in gold. The white satin of her dress, which was very fashionable for women of the Empire, as well as her crown, complete the royal allure of this luxurious outfit. This depiction of Caroline Bonaparte in such clothing was not by chance – the portraitist was Élisabeth Louise Vigée Le Brun, the official painter under Marie-Antoinette. Caroline is therefore portrayed as one of the most powerful women inhabiting the upper echelons of society. Indeed, it was around the time of this portrait that Caroline’s brother, the Emperor Napoleon, gave Caroline and her husband Joachim the Grand Duchy of Berg and of Clèves. Caroline is not only depicted as an elegant, important woman in this portrait, but also as a mother – she is often painted with children. Her eldest daughter, Letizia, who was four years old at the time, is on her right. Letizia is dressed very simply in a white dress that matches her mother’s. Both of them are smiling delightfully and Letizia brightens up a portrait that would have otherwise been a lot more serious. This work belongs to the Collection at Versailles. II. Who is Caroline, the sister of Napoleon I? Caroline was born on 25 March 1782 as the youngest of Napoleon’s three sisters and the penultimate child of the family (Jérôme was the last). Caroline had had a difficult childhood; her family was driven out of Corsica, her birthplace, to France as her family was thought to have been traitors of the Corsican independence, a cause supported by many revolutionaries after the fall of Louis XVI. The Bonapartes first settled in Marseille in 1793, and then, taking advantage of the military and political successes of the young general Bonaparte (later to be Napoleon I), the family moved to Paris. 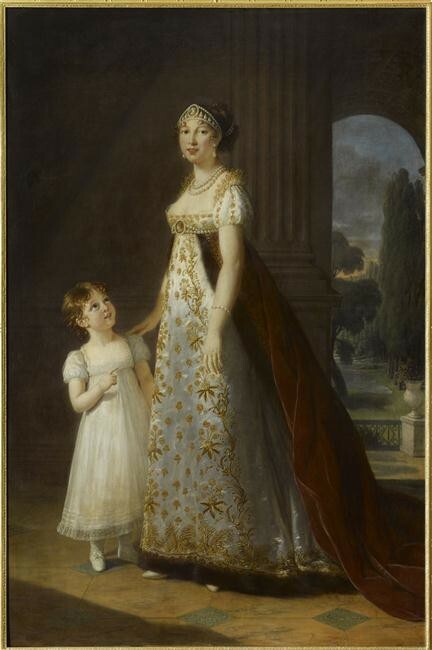 Caroline was sent to the boarding school of Madame Campan at Saint-Germain-en-Laye, where she made friends with Hortense, the daughter of Joséphine de Beauharnais, (who would go on to marry Napoleon I in 1796). Soon, a young suitor, the général de brigade Joachim Murat, would ask Napoleon to marry his sister (Joachim had helped Napoleon during the coup d’État on 9 November 1799). Caroline and Joachim married on 20 January 1800 and they went on to have four children: Achille, Letizia, Lucien and Louis. As Napoleon established his power, Caroline and her husband took advantage, and established their wealth and reputation by throwing multiple parties in their different Parisian hotels. Joachim’s military successes and his promotion to général de division contributed to the couple’s high standing with Napoleon, as well as the royal court. When Napoleon was crowned Emperor of the French in 1804, Caroline demanded of the newly crowned Napoleon I to be crowned herself as Her Royal Imperial Highness, the same title given to Napoleon’s brothers and their respective wives. This title, however, was not enough for Caroline and Joachim, and in 1806 they were granted the Grand Duchy of Berg and of Clèves. Two years later, they were made King and Queen Consorts of Naples, with Caroline as co-leader of the Kingdom during Joachim’s temporary absences when he was called up to take part in military campaigns for the French Empire. As the Queen of Naples, Caroline was interested not only in politics, but also in economics and art. And so she began her efforts to kick-start the Neapolitan economy by supporting the textile manufacturers, prioritising girls’ education, and encouraging archaeological digs at Pompeii. She also undertook the task of decorating the palaces with style, and therefore commissioned paintings by her favourite painter, Ingres, notably La Grande Odalisque in 1814. From 1810, the Murats tried to cut loose from the guiding influence of Napoleon in the hope of independence for the Kingdom of Naples. This displeased Napoleon, who reminded them in a letter that he had made Joachim King only to serve his own system. After the failures of the Russian campaign in 1812 and the German campaign in 1813, Caroline Murat felt that Naples was at great risk of being attacked by the European states that had united against Napoleon. She therefore tried to negotiate with Austria, which had a large presence in Italy and directly threatened Naples. In January 1814, while the European Allies threatened Paris, Caroline managed to keep hold of her status as Queen, just a few months before Napoleon’s first abdication on 4 April 1814. Napoleon felt betrayed, and his relationship with the Murats was paralysed for months. In summer 1814, Joachim Murat began contacting the disposed Emperor, exiled on the island Elba, by sending him clandestine letters. Shortly after, Napoleon left Elba and returned to Paris on 1 March 1815. The following period, the Hundred Days, threatened to destabilise the Murats’ power over Naples. Joachim threw himself into the anti-Allies campaign to stir up a public insurrection in Italy, in the hope that he would become King. Caroline tried to rule the Kingdom of Naples, somehow or other, whilst under pressure from Austria and Britain. Napoleon’s defeat at Waterloo on 18 June was the fulfilment of Caroline’s dream to maintain power. She moved to Austria, where she heard of Joachim’s death, who had been executed in Italy on 13 October 1815. It was Napoleon’s death in 1821 that freed her from the surveillance of the Austrian Empire and she was able to move Florence, where she died on 18 May 1839. In 1822, her oldest son Achille had moved to the United States and was joined there by his brother Lucien in 1824.